*Space opera setting. Cool descriptions of spaceship tech. The worldbuilding is a little fuzzy in terms of how everything was connected and how that reality evolved the way it did (e.g., spirit guide abilities). It didn't detract me in a big way, but there's still origin-type information I wouldn't mind knowing about the universe the characters inhabit. There's no hard science to speak of, so the technology parts are accessible. *Story is told from the POV of heroine Alana Quick. Her coming-of-age journey includes frequent introspection. She aspires to become a "sky surgeon" (i.e., engineer) and have adventures among the stars. *Alana is a disabled queer woman of color from a working class background, and diversity is represented in other characters as well. *Types of science fiction: Philosophical, psychological, sociological, and a splash of action-adventure. Lots of Deep Thoughts. For a spoiler-filled analysis that expands on this aspect, read Olivia Waite's K is for Jacqueline Koyanagi. *ASCENSION features a family-like cast of characters. I'll go ahead and make the inevitable comparison: the tale has a FIREFLY-esque, ragtag crew ensemble (except ASCENSION is what FIREFLY would look like told from the perspective of a disabled queer woman of color!). This aspect reminds me of Donna S. Frelick's Spacefreighters Lounge post in which she reflects on how stories featuring a warm circle of family and friends might help make science fiction romance more appealing to romance readers. *The prose has a lyrical quality to it, with lots of poetic description. You may catch yourself reading some sentences a time or two to savor them. Overall, the story progresses at a leisurely pace. *Alana has a complicated, tension-filled relationship with her sister, Nova. Nova is a "spirit guide." She's kind of like STAR TREK: THE NEXT GENERATION's Deanna Troi, only more powerful. *Women characters are the default in this story. *The story features polyamorous relationships executed in a mature way that serves the story. *I'd tag ASCENSION as veering toward romantic SF. The romance is subtle and despite the accelerated pace of Alana's "love at first sight" attraction, develops at a slow burn. Heat level: mild. It was a bit too underdeveloped for my taste. But for readers who go into ASCENSION mainly for the SF part, it might be just the right amount. *There are tragic moments, but the story has a hopeful ending. 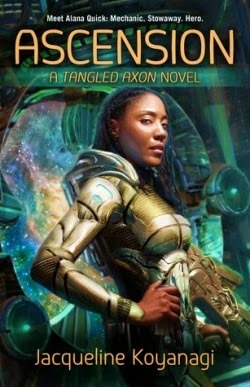 ASCENSION has received a lot of buzz—in large part for its diverse characters—and it's great to witness a book combining SF, romance, and diversity garner so much attention.